Big Media is losing its monopoly on the news, thanks to the Internet – that “citizen journalists” of all stripes, in their independent, unfiltered reports, are transforming the news from a lecture to a conversation. 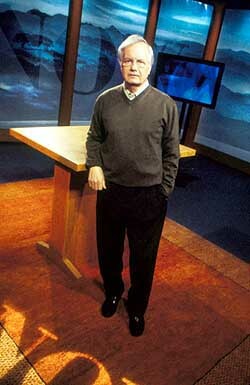 Bill Moyers is a broadcast journalist currently hosting the PBS program Now With Bill Moyers. Moyers also serves as president of the Schumann Center for Media and Democracy, which gives financial support to TomPaine.com. Thank you for inviting me to share this occasion with you. Three months from now I will be retiring from active journalism and I cannot imagine a better turn into the home stretch than this morning with you. My life in journalism began 54 years ago, on my 16th birthday, in the summer before my junior year in high school, when I went to work as a cub reporter for the Marshall News Messenger in the East Texas town of 20,000 where I had grown up. Early on, I got one of those lucky breaks that define a life’s course. Some of the old timers were sick or on vacation and Spencer Jones, the managing editor, assigned me to help cover the Housewives' Rebellion. Fifteen women in town refused to pay the Social Security withholding tax for their domestic workers. They argued that social security was unconstitutional, that imposing it was taxation without representation, and that—here’s my favorite part—“requiring us to collect (the tax) is no different from requiring us to collect the garbage.” They hired a lawyer—Martin Dies, the former Congressman notorious for his work as head of the House Committee on Un-American Activities—but to no avail. The women wound up holding their noses and paying the tax. In the meantime the Associated Press had picked up our coverage and turned the rebellion into a national story. One day after it was all over, the managing editor called me over and pointed to the ticker beside his desk. Moving across the wire was a “Notice to the Editor” citing one Bill Moyers and the News Messenger for the reporting we had done on the rebellion. I was hooked. So I have. My path led me on to graduate school, a detour through seminary, then to LBJ’s side in Washington, and, from there, through circumstances so convulted I still haven’t figured them out, back to journalism, first at Newsday and then the big leap from print to television, to PBS and CBS and back again—just one more of those vagrant journalistic souls who, intoxicated with the moment is always looking for the next high: the lead not yet written, the picture not yet taken, the story not yet told. It took me awhile after I left government to get my footing back in journalism. I had to learn all over again that what’s important for the journalist is not how close you are to power but how close you are to reality. I’ve seen plenty of reality. Journalism took me to famine and revolution in Africa and to war in Central America; it took me to the bedside of the dying and delivery rooms of the newborn. It took me into the lives of inner-city families in Newark and working-class families in Milwaukee struggling to find their place in the new global economy. CBS News paid me richly to put in my two cents worth on just about anything that happened on a given day. As a documentary journalist I’ve explored everything from the power of money in politics to how to make a poem. I’ve investigated the abuse of power in the Watergate and Iran-Contra scandals and the unanswered questions of 9/11. I’ve delved into the “Mystery of Chi” in Chinese traditional medicine as well as the miracle that empowered a one-time slave trader to write the hymn, “Amazing Grace.” Journalism has been a continuing course in adult education—my own; other people paid the tuition and travel, and I’ve never really had to grow up and get a day job. I made a lot of mistakes along the way, but I’ve enjoyed the company of colleagues as good as they come, who kept inspiring me to try harder. That’s how I felt 25 five years ago when my colleague Sherry Jones and I produced the first documentary ever about the purchase of government favors by political action committees. When we unfurled across the Capitol grounds yard after yard of computer printouts listing campaign contributions to every member of Congress, there was a loud outcry, including from several politicians who had been allies just a few years earlier when I worked at the White House. I loved it, too, when Sherry and I connected the dots behind the Iran-Contra scandal. That documentary sent the right-wing posse in Washington running indignantly to congressional supporters of public television who accused PBS of committing— horrors!— journalism right on the air. While everyone else was all over the Monica Lewinsky imbroglio, Sherry and I took after Washington’s other scandal of the time— the unbridled and illegal fundraising by Democrats in the campaign of 1996. This time it was Democrats who wanted me arrested. But taking on political scandal is nothing compared to what can happen if you raise questions about corporate power in Washington. When my colleagues and I started looking into the subject of pesticides and food for a Frontline documentary, my producer Marty Koughan learned that industry was attempting behind closed doors to dilute the findings of a National Academy of Sciences study on the effects of pesticide residues on children. Before we finished the documentary, the industry somehow purloined a copy of our draft script—we still aren’t certain how—and mounted a sophisticated and expensive campaign to discredit our broadcast before it aired. Television reviewers and editorial page editors were flooded in advance with pro-industry propaganda. There was a whispering campaign. A Washington Post columnist took a dig at the broadcast on the morning of the day it aired—without even having seen it—and later confessed to me that the dirt had been supplied by a top lobbyist for the chemical industry. Some public television managers across the country were so unnerved by the blitz of dis-information they received from the industry that before the documentary had even aired, they protested to PBS with letters prepared by the industry. Here’s what most perplexed us: Eight days before the broadcast, the American Cancer Society—an organization that in no way figured in our story—sent to its three thousand local chapters a “critique” of the unfinished documentary claiming, wrongly, that it exaggerated the dangers of pesticides in food. We were puzzled. Why was the American Cancer Society taking the unusual step of criticizing a documentary that it had not seen, that had not aired, and that did not claim what the society alleged? An enterprising reporter in town named Sheila Kaplan looked into these questions for Legal Times and discovered that a public relations firm, which had worked for several chemical companies, also did pro bono work for the American Cancer Society. The firm was able to cash in some of the goodwill from that “charitable” work to persuade the compliant communications staff at the Society to distribute some harsh talking points about the documentary— talking points that had been supplied by, but not attributed to, the public relations firm. Others also used the American Cancer Society’s good name in efforts to tarnish the journalism before it aired; including right-wing front groups who railed against what they called “junk science on PBS” and demanded Congress pull the plug on public television. PBS stood firm. The documentary aired, the journalism held up, and the National Academy of Sciences felt liberated to release the study that the industry had tried to demean. They never give up. Sherry and I spent more than a year working on another documentary called Trade Secrets , based on revelations—found in the industry’s archives—that big chemical companies had deliberately withheld from workers and consumers damaging information about toxic chemicals in their products. These internal industry documents are a fact. They exist. They are not a matter of opinion or point of view. And they portrayed deep and pervasive corruption in a major American industry, revealing that we live under a regulatory system designed by the industry itself. If the public and government regulators had known over the years what the industry was keeping secret about the health risks of its products, America’s laws and regulations governing chemical manufacturing would have been far more protective of human health than they were. Hoping to keep us from airing those secrets, the industry hired a public relations firm in Washington noted for using private detectives and former CIA, FBI, and drug enforcement officers to conduct investigations for corporations. One of the company’s founders was on record as saying that sometimes corporations need to resort to unconventional resources, including “using deceit”, to defend themselves. Given the scurrilous underground campaign that was conducted to smear our journalism, his comments were an understatement. Not only was there the vicious campaign directed at me personally, but once again pressure was brought to bear on PBS through industry allies in Congress. PBS stood firm, the documentary aired, and a year later the National Academy of Television Arts and Sciences awarded Trade Secrets an Emmy for outstanding investigative journalism. I’ve gone on like this not to regale you with old war tales but to get to a story that is the one thing I hope you might remember from our time together this morning. John Henry Faulk told me this story. Most of you are too young to remember John Henry—a wonderful raconteur, entertainer, and a popular host on CBS Radio back when radio was in its prime. But those were days of paranoia and red-baiting—the McCarthy era—and the right-wing sleaze merchants went to work on John Henry with outlandish accusations that he was a communist. A fearful CBS refused to rehire him and John Henry went home to Texas to live out his days. He won a famous libel suit against his accusers and wrote a classic book about those events and the meaning of the First Amendment. In an interview I did with him shortly before his death a dozen years ago, John Henry told the story of how he and friend Boots Cooper were playing in the chicken house when they were about 12 years old. They spied a chicken snake in the top tier of nests, so close it looked like a boa constrictor. As John Henry told it to me, “All the frontier courage drained out our heels—actually it trickled down our overall legs—and Boots and I made a new door through the henhouse wall.” His momma came out and, learning what the fuss was about, said to Boots and John Henry: “Don’t you know chicken snakes are harmless? They can’t hurt you.” And Boots, rubbing his forehead and behind at the same time, said, “Yes, Mrs. Faulk, I know that, but they can scare you so bad, it’ll cause you to hurt yourself.” John Henry Faulk told me that’s a lesson he never forgot. It’s a good one for any journalist to tuck away and call on when journalism is under fire. Our job remains essentially the same: to gather, weigh, organize, analyze and present information people need to know in order to make sense of the world. You will hear it said this is not a professional task—John Carroll of the Los Angeles Times recently reminded us there are “no qualification tests, no boards to censure misconduct, no universally accepted set of standards.” Maybe so. But I think that what makes journalism a profession is the deep ethical imperative of which the public is aware only when we violate it—think Jayson Blair, Stephen Glass, Jim Kelly. Ed Wasserman, once an editor himself and now teaching at Washington and Lee University, says that journalism “is an ethical practice because it tells people what matters and helps them determine what they should do about it.” So good newsrooms “are marinated in ethical conversations…What should this lead say? What I should I tell that source?” We practice this craft inside “concentric rings of duty and obligations: Obligations to sources, our colleagues, our bosses, our readers, our profession, and our community”—and we function under a system of values “in which we try to understand and reconcile strong competing claims.” Our obligation is to sift patiently and fairly through untidy realities, measure the claims of affected people, and present honestly the best available approximation of the truth—and this, says Ed Wasserman, is an ethical practice. It’s never been easy, and it’s getting harder. For more reasons then you can shake a stick at. One is the sheer magnitude of the issues we need to report and analyze. My friend Bill McKibben enjoys a conspicuous place in my pantheon of journalistic heroes for his pioneer work in writing about the environment; his bestseller The End of Nature carried on where Rachel Carson’s Silent Spring left off. Recently in Mother Jones, Bill described how the problems we cover—conventional, manageable problems, like budget shortfalls, pollution, crime—may be about to convert to chaotic, unpredictable situations. He puts it this way: If you don’t have a job, “that’s a problem, and unemployment is a problem, and they can both be managed: You learn a new skill, the Federal Reserve lowers interest rates to spur the economy. But millions of skilled, well-paying jobs disappearing to Bangalore is a situation; it’s not clear what, if anything, the system can do to turn it around.” Perhaps the most unmanageable of all problems, Bill McKibben writes, is the accelerating deterioration of the environment. While the present administration has committed a thousand acts of vandalism against our air, water, forests and deserts, were we to change managers, Bill argues, some of that damage would abate. What won’t go away, he continues, are the perils with huge momentum—the greenhouse effect, for instance. Scientists have been warning us about it since the 1980s. But now the melt of the Arctic seems to be releasing so much freshwater into the North Atlantic that even the Pentagon is alarmed that a weakening Gulf Stream could yield abrupt—and overwhelming—changes, the kind of climate change that threatens civilization. How do we journalists get a handle on something of that enormity? Or on ideology. One of the biggest changes in my lifetime is that the delusional is no longer marginal. How do we fathom and explain the mindset of violent exhibitionists and extremists who blow to smithereens hundreds of children and teachers of Middle School Number One in Beslan, Russia? Or the radical utopianism of martyrs who crash hijacked planes into the World Trade Center? How do we explain the possibility that a close election in November could turn on several million good and decent citizens who believe in the Rapture Index? That’s what I said—the Rapture Index; Google it and you will understand why the best-selling books in America today are the 12 volumes of the "Left Behind" series that have earned multi-millions of dollars for their co-authors, who, earlier this year, completed a triumphant tour of the Bible Belt whose buckle holds in place George W. Bush’s armor of the Lord. These true believers subscribe to a fantastical theology concocted in the l9th century by a couple of immigrant preachers who took disparate passages from the Bible and wove them into a narrative millions of people believe to be literally true. According to this narrative, Jesus will return to earth only when certain conditions are met: when Israel has been established as a state; when Israel then occupies the rest of its “biblical lands;” when the third temple has been rebuilt on the site now occupied by the Dome of the Rock and Al Aqsa mosques; and, then, when legions of the Antichrist attack Israel. This will trigger a final showdown in the valley of Armageddon during which all the Jews who have not converted will be burned. Then the Messiah returns to earth. The Rapture occurs once the big battle begins. True believers ”will be lifted out of their clothes and transported to heaven where, seated next to the right hand of God, they will watch their political and religious opponents suffer plagues of boils, sores, locusts and frogs during the several years of tribulation which follow." I’m not making this up. We’re reported on these people for our weekly broadcast on PBS, following some of them from Texas to the West Bank. They are sincere, serious and polite as they tell you that they feel called to help bring the Rapture on as fulfillment of biblical prophecy. That’s why they have declared solidarity with Israel and the Jewish settlements and backed up their support with money and volunteers. It’s why they have staged confrontations at the old temple site in Jerusalem. It’s why the invasion of Iraq for them was a warm-up act, predicted in the 9th chapter of the Book of Revelations where four angels “which are bound in the great river Euphrates will be released “to slay the third part of men.’ As the British writer George Monbiot has pointed out, for these people, the Middle East is not a foreign policy issue, it’s a biblical scenario, a matter of personal belief. A war with Islam in the Middle East is not something to be feared but welcomed; if there’s a conflagration there, they come out winners on the far side of tribulation, inside the pearly gates, in celestial splendor, supping on ambrosia to the accompaniment of harps plucked by angels. I know, I know: You think I am bonkers. You think Ann Coulter is right to aim her bony knee at my groin and that O’Reilly should get a Peabody for barfing all over me for saying there’s more to American politics than meets the Foxy eye. But this is just the point: Journalists who try to tell these stories, connect these dots, and examine these links are demeaned, disparaged and dismissed. This is the very kind of story that illustrates the challenge journalists face in a world driven by ideologies that are stoutly maintained despite being contradicted by what is generally accepted as reality. Ideologues—religious, political, or editorial ideologues—embrace a world view that cannot be changed because they admit no evidence to the contrary. And Don Quixote on Rocinante tilting at windmills had an easier time of it than a journalist on a laptop tilting with facts at the world’s fundamentalist belief systems. For one thing, you’ll get in trouble with the public. The Chicago Tribune recently conducted a national poll in which about half of those surveyed said there should be been some kind of press restraint on reporting about the prison abuse scandal in Iraq; I suggest those people don’t want the facts to disturb their belief system about American exceptionalism. The poll also found that five or six of every 10 Americans “would embrace government controls of some kind on free speech, especially if it is found unpatriotic.” No wonder scoundrels find refuge in patriotism; it offers them immunity from criticism. In the interest of full disclosure, I digress here to say that I was present when President Lyndon Johnson signed the Freedom of Information Act on July 4, 1966. In language that was almost lyrical, he said he was signing it “with a deep sense of pride that the United States is an open society in which the people’s right to know is cherished and guarded.” But as his press secretary at the time, I knew something that few others did: LBJ had to be dragged kicking and screaming to the signing ceremony. He hated the very idea of FOIA, hated the thought of journalists rummaging in government closets, hated them challenging the official review of realty. He dug in his heels and even threatened to pocket-veto the bill after it reached the White House. Only the tenacity of a congressman named John Moss got the bill passed at all, and that was after a 12-year battle against his elders in Congress, who blinked every time the sun shined in the dark corridors of power. They managed to cripple the bill Moss had drafted, and even then, only some last-minute calls to LBJ from a handful of newspaper editors overcame the president’s reluctance. He signed “the f------ thing,” as he called it, and then set out to claim credit for it. But never has there been an administration like the one in power today—so disciplined in secrecy, so precisely in lockstep in keeping information from the people at large and, in defiance of the Constitution, from their representatives in Congress. The litany is long: The president’s chief of staff orders a review that leads to at least 6000 documents being pulled from government websites. The Defense Department bans photos of military caskets being returned to the U.S. To hide the influence of Kenneth Lay, Enron, and other energy moguls, the vice president stonewalls his energy task force records with the help of his duck-hunting pal on the Supreme Court. The CIA adds a new question to its standard employee polygraph exam, asking, “Do you have friends in the media?” There have been more than 1200 presumably terrorist-related arrests and 750 people deported, and no one outside the government knows their names, or how many court docket entries have been erased or never entered. Secret federal court hearings have been held with no public record of when or where or who is being tried. Secrecy is contagious. The Nuclear Regulatory Commission has announced that “certain security information included in the reactor oversight process” will no longer be publicly available, and no longer be updated on the agency’s website. New controls are being imposed on space surveillance data once found on NASA’s web site. One of the authors of the ASNE report, Pete Weitzel, former managing editor of The Miami Herald and now coordinator for the Coalition of Journalists for Open Government, describes how Section 214 of the Homeland Security Act makes it possible for a company to tell Homeland Security about an eroding chemical tank on the bank of a river, but DHS could not disclose this information publicly or, for that matter, even report it to the Environmental Protection Agency. And if there were a spill and people were injured, the information given DHS could not be used in court! Secrecy is contagious—and scandalous. The Washington Post reports that nearly 600 times in recent years, a judicial committee acting in private has stripped information from reports intended to alert the public to conflicts of interest involving federal judges. Secrecy is contagious, scandalous—and toxic. According to the ASNE report, curtains are falling at the state and local levels, too. The tiny south Alabama town of Notasulga decided to allow citizens to see records only one hour a month. It had to rescind the decision, but now you have to make a request in writing, make an appointment and state a reason for wanting to see any document. The state legislature in Florida has adopted 14 new exemptions to its sunshine and public record laws. Over the objections of law enforcement officials and Freedom of Information advocates, they passed a new law prohibiting police from making lists of gun owners even as it sets a fine of $5 million for violation. This “zeal for secrecy” I am talking about—and I have barely touched the surface—adds up to a victory for the terrorists. When they plunged those hijacked planes into the World Trade Center and the Pentagon three years ago this morning, they were out to hijack our Gross National Psychology. If they could fill our psyche with fear—as if the imagination of each one of us were Afghanistan and they were the Taliban—they could deprive us of the trust and confidence required for a free society to work. They could prevent us from ever again believing in a safe, decent or just world and from working to bring it about. By pillaging and plundering our peace of mind they could panic us into abandoning those unique freedoms—freedom of speech, freedom of the press—that constitute the ability of democracy to self-correct and turn the ship of state before it hits the iceberg. I have become a nuisance on this issue—if not a fanatic—because I grew up in the South, where, for so long, truthtellers were driven from the pulpit, the classroom and the newsroom; it took a bloody civil war to drive home the truth of slavery, and still it took another hundred of years of cruel segregation and oppression before the people freed by that war finally achieved equal rights under the law. Not only did I grow up in the South, which had paid such a high price for denial, but I served in the Johnson White House during the early escalation of the Vietnam War. We circled the wagons and grew intolerant of news that did not confirm to the official view of reality, with tragic consequences for America and Vietnam. Few days pass now that I do not remind myself that the greatest moments in the history of the press came not when journalists made common cause with the state, but when they stood fearlessly independent of it. Look at what’s happening to newspapers. A study by Mark Cooper of the Consumer Federation of America reports that two-thirds of today’s newspaper markets are monopolies. I urge you to read a new book—Leaving Readers Behind: The Age of Corporate Newspapering (published as part of the Project on the State of the American Newspaper under the auspices of the Pew Charitable Trust)—by a passel of people who love journalism: the former managing editor of the New York Times, Gene Roberts; the dean of the Philip Merrill College of Journalism, Thomas Kunkel; the veteran reporter and editor, Charles Layton, as well as contributors such as Ken Auletta, Geneva Overholser, and Roy Reed. They find that a generation of relentless corporatization has diminished the amount of real news available to the consumer. They write of small hometown dailies being bought and sold like hog futures; of chains, once content to grow one property at a time, now devouring other chains whole; of chains effectively ceding whole regions of the country to one another, minimizing competition; of money pouring into the business from interests with little knowledge and even less concern about the special obligations newspapers have to democracy. They point as one example to the paper in Oshkosh, Wis., with a circulation of 23,500, which prided itself on being in hometown hands since the Andrew Johnson administration. In 1998, it was sold not once but twice, within the space of two months. Two years later it was sold again: four owners in less than three years. In New Jersey, the Gannett Chain bought the Asbury Park Press , then sent in a publisher who slashed 55 people from the staff and cut the space for news, and who was rewarded by being named Gannett’s manager of the year. Roberts and team come to the sobering conclusion that the real momentum of consolidation is just beginning—that it won’t be long now before America is reduced to half a dozen major print conglomerates. They illustrate the consequences with one story after another. In Cumberland, Md., the police reporter had so many duties piled upon him that he no longer had time to go to the police station for the daily reports. But management had a cost-saving solution: Put a fax machine in the police station and let the cops send over the news they thought the paper should have. (“Any police brutality today, officer?” “No, if there is, we’ll fax a report of it over to you.”) On a larger scale, the book describes a wholesale retreat in coverage of key departments and agencies in Washington. At the Social Security Administration, whose activities literally affect every American, only the New York Times was maintaining a full-time reporter. And incredibly, there were no full-time reporters at the Interior Department, which controls millions of acres of public land and oversees everything from the National Park Service to the Bureau of Indian Affairs. Out across the country there’s a virtual blackout of local public affairs. The Alliance for Better Campaigns studied 45 stations in six cities in one week in October 2003. Out of 7,560 hours of programming analyzed, only 13 were devoted to local public affairs—less than one-half of one percent of local programming nationwide. A profound transformation is happening here. The framers of our nation never envisioned these huge media giants; never imagined what could happen if big government, big publishing and big broadcasters ever saw eye to eye in putting the public’s need for news second to their own interests—and to the ideology of free-market economics. The debate over who and isn’t a journalist is worth having, although we don’t have time for it now. You can read a good account of the latest round in that debate in the September 26 Boston Globe, where Tom Rosenthiel reports on the Democratic Convention’s efforts to decide “which scribes, bloggers, on-air correspondents and on-air correspondents and off-air producers and camera crews” would have press credentials and access to the action. Bloggers were awarded credentials for the first time, and, I, for one, was glad to see it. I’ve just finished reading Dan Gillmor’s new book, We the Media, and recommend it heartily to you. Gilmore is a national columnist for the San Jose Mercury News and writes a daily weblog for SiliconValley.com. He argues persuasively that Big Media is losing its monopoly on the news, thanks to the Internet – that “citizen journalists” of all stripes, in their independent, unfiltered reports, are transforming the news from a lecture to a conversation. He’s on to something. In one sense we are discovering all over again the feisty spirit of our earliest days as a nation when the republic and a free press were growing up together. It took no great amount of capital and credit—just a few hundred dollars—to start a paper then. There were well over a thousand of them by 1840. They were passionate and pugnacious and often deeply prejudiced; some spoke for Indian-haters, immigrant-bashers, bigots, jingoes, and land-grabbers. But some called to the better angels of our nature—Tom Paine, for one, the penniless immigrant from England, who, in 1776 –just before joining Washington’s army—published the hard-hitting pamphlet Common Sense , with its uncompromising case for American independence. It became our first best-seller because Paine was possessed of an unwavering determination to reach ordinary people—to “make those that can scarcely read understand” and “to put into language as plain as the alphabet” the idea that they mattered and could stand up for their rights. But Francisco Ortiz Franco thought it mattered. The crusading reporter co-founded a weekly magazine in Tijuana whose motto is “Free like the Wind.” He was relentless in exposing the incestuous connections between wealthy elites in Baja, Calif. and its most corrupt law enforcement agencies and with the most violent of drag cartels. Several months ago, Francisco Ortiz Franco died sitting at the wheel of his car outside a local clinic—shot four times while his two children, aged eight and l0, looked on from the back seat. As his blood was being hosed off the pavement, more than l00 of his fellow Mexican reporters and editors marched quietly through the streets, holding their pens defiantly high in the air. They believe journalism matters. Manic Saha thought journalism mattered. He was a correspondent with the daily New Age in Bangladesh, as well as a contributor to the BBC’s Bengali-language service. Saha was known for his bold reporting on criminal gangs, drug traffickers, and Maoist insurgents and had kept it up despite a series of death threats. Earlier this year, as Saha was heading home from the local press club, assailants stopped his rickshaw and threw a bomb at him. When the bomb exploded he was decapitated. Manik Saha died because journalism matters. Jose Carlos Araujo thought journalism mattered. The host of a call-in talk show in northeastern Brazil, Araujo regularly denounced death squads and well-known local figures involved in murders. On April 24 of this year, outside his home, at 7:30 in the morning, he was ambushed and shot to death. Because journalism matters. Aiyathurai Nadesan thought journalism mattered. A newspaper reporter in Sri Lanka, he had been harassed and threatened for criticizing the government and security forces. During one interrogation, he was told to stop writing about the army. He didn’t. On the morning of May 3l, near a Hindu temple, he was shot to death—because journalism matters. I could go on: The editor-in-chief of the only independent newspaper in the industrial Russian city of Togliatti, shot to death after reporting on local corruption; his successor stabbed to death 18 months later; a dozen journalists in all, killed in Russia over the last five years and none of their murderers brought to justice. Cuba’s fledgling independent press has been decimated by the arrest and long-term imprisonment of 29 journalists in a crackdown last year; they are being held in solitary confinement, subjected to psychological torture, surviving on rotten and foul-smelling food. Why? Because Fidel Castro knows journalism matters. The totalitarian regime of Turkmenistan believes journalism matters—so much so that all newspapers, radio and television stations have been placed under strict state control. About the only independent information the people get is reporting broadcast from abroad by Radio Free Europe-Radio Liberty. A stringer for that service, based in the Turkmenistan capital, was detained and injected multiple times with an unknown substance. In the Ukraine, Dmitry Shkuropat, a correspondent for the independent weekly Iskra, who had been working on a story about government corruption, was beaten in the middle of the day on a main street in the city of Zaporozhy and taped interviews for his pending story were taken. The director of Iskra told the Committee to Protect Journalists (to whom I am indebted for these examples) said that the newspaper often receives intimidating phone calls from local business and political authorities after publishing critical articles, but he refused to identify the callers, saying he feared retaliation. Obviously, in the Ukraine journalism matters. We have it so easy here in this country. America is a utopia for journalists. Don Hewitt, the creator of "60 Minutes," told me a couple of years ago that “the 1990s were a terrible time for journalism in this country but a wonderful time for journalists; we’re living like Jack Welch,” he said, referring to the then CEO of General Electric. Perhaps that is why we weren’t asking tough questions of Jack Welch. Because we have it so easy in America, we tend to go easy on America—so easy that maybe Simon’s right; compared to entertainment and propaganda, maybe journalism doesn’t matter. But I approach the end of my own long run believing more strongly than ever that the quality of journalism and the quality of democracy are inextricably joined. The late Martha Gellhorn, who spent half a century reporting on war and politicians—and observing journalists, too—eventually lost her faith that journalism could, by itself, change the world. But the act of keeping the record straight is valuable in itself, she said. “Serious, careful, honest journalism is essential, not because it is a guiding light but because it is a form of honorable behavior, involving the reporter and the reader.” I second that. I believe democracy requires “a sacred contract” between journalists and those who put their trust in us to tell them what we can about how the world really works. PCOL sits down for an extended interview with Peace Corps Director Gaddi Vasquez. Read the entire interview from start to finish and we promise you will learn something about the Peace Corps you didn't know before. Plus the debate continues over Safety and Security. 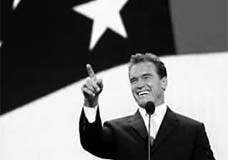 Governor Schwarzenegger praised the Peace Corps at the Republican National Convention: "We're the America that sends out Peace Corps volunteers to teach village children." Schwarzenegger has previously acknowledged his debt to his father-in-law, Peace Corps Founding Director Sargent Shriver, for teaching him "the joy of public service" and Arnold is encouraging volunteerism by creating California Service Corps and tapping his wife, Maria Shriver, to lead it. Leave your comments and who can come up with the best Current Events Funny? Teresa Heinz Kerry celebrates the Peace Corps Volunteer as one of the best faces America has ever projected in a speech to the Democratic Convention. The National Review disagreed and said that Heinz's celebration of the PCV was "truly offensive." What's your opinion and can you come up with a Political Funny?